The K0047 Corrosion Cell Kit is ideal for testing and evaluation of metal specimens in corrosive environments. It is fashioned after a well known cell configuration and is a standard in many ASTM methods. The cell permits a series of metal specimens and liquid environments to be tested quickly and uniformly. Most of the common electrochemical techniques for corrosion testing can be employed under aggressive conditions (except for HF) and at ambient or elevated temperatures. The standard specimen holder included in the kit is designed to accept cylindrical specimens 1/2" (1.27 cm) long, 3/8" (0.95) cm in diameter, drilled to a depth of 1/4" and tapped to accept a 3-48 thread. The cell will accommodate other working-electrode geometries as long as the specimen can clear the 45 mm (1-3/4") diameter opening provided for the electrode holder. The K0105 extends the versatility of the basic K0047 corrosion measurement system by allowing the corrosion characteristics of flat specimens to be readily determined. This Tefzel holder is designed to accept flat specimens 0.625 ± 0.010" in diameter and up to 1/8" thick. The sealing washer is made of Kalrez and exposes 1 cm2 of the specimen to the test solution. 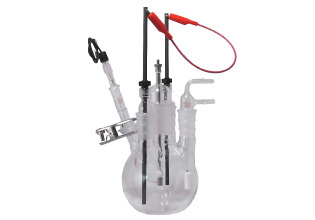 The flat specimen holder attaches to G0097 electrode holder so that it can be used with the G0096 corrosion flask. The 2517-0921-0 Sample Holder Rod is made of 303 Stainless Steel. This kit contains 4 replacement Kalrez washers for the K0105 Flat Specimen Holder Kit. This washer eliminates crevice corrosion in the K0105 Flat Specimen Holder by sealing with a "knife-edge" instead of a flat surface. This Teflon washer is used in place of the normal Kalrez sealing washer, K0157. Due to the cold-flow characteristics of Teflon, these gaskets should be used once and discarded. They can be purchased in a package of 25. The K0106 O-ring kit contains three pairs of replacement Kalrez O-rings and washers. The Kalrez washers are elastic and can be used many times before needing replacement. This glass adapter is used for temperature controlled experiments where use of a thermometer is necessary. It can be used in place of one of the G0098 threaded counter electrode adapters. It accomodates the G0091 Graphite Rod as well as a standard 1/4" diameter thermometer and includes a fitting for purge gas. Thermometer not included.